Macular degeneration is an eye condition where the macula area of the retina begins to breakdown and deteriorates. The macula is a small part of the overall retina, but is critical to central vision and seeing small details. The macula is the part of the retina that allows you to use your sight for such tasks as reading a computer screen, viewing a text message or setting the cooking time on the microwave oven. 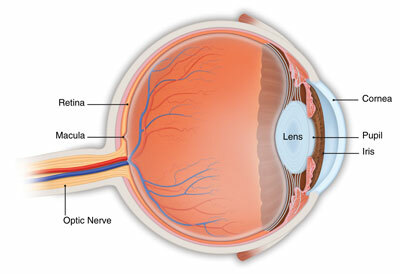 The remaining part of the retina is called the peripheral retina. This part of the retina gives you side or peripheral vision. Many people develop macular degeneration as they age into the senior years of life. There are various macular related eye problems, but age-related macular degeneration or AMD is the most common. Macular degeneration usually does not affect side or peripheral vision. However, it does impact central vision. Symptoms of macular degeneration may include blurred central vision, dark areas in central vision or loss of central vision. Macular degeneration is normally caused by the formation of deposits under the retina or the growth of abnormal blood vessels under the retina. There are two types of macular degeneration: dry macular degeneration and wet macular degeneration. The dry form of macular degeneration is the most common. Deposits form under the retina causing the tissues of the macula to become thin and stop working properly. With dry macular degeneration, the loss of vision is typically a slow and gradual process. The more problematic type of macular degeneration is wet macular degeneration. It can cause significant damage to central vision. Wet macular degeneration is a condition where abnormal blood vessels develop under the retina. These blood vessels can leak fluid or blood and distort vision. Loss of vision from wet macular degeneration is usually much faster and more noticeable than dry macular degeneration. Many people who develop macular degeneration are not aware of this eye condition until they start to notice vision problems. Diagnosing macular degeneration early is vital to preserving central vision. It’s one of the many reasons why scheduling and attending regular eye exams as recommended by your eye doctor are so important.